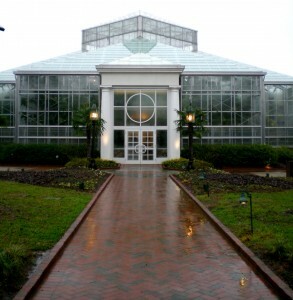 Even on a rainy day the Orchid Conservatory is an impressive sight. Just outside of Belmont, North Carolina there are over 100 acres of gardens waiting to be explored at the Daniel Stowe Botanical Gardens. From willow mazes to garden fountains these gorgeously laid out botanic wonders offer a full sensory experience to visitors young and old year round. However on this cool, rainy January day it was to the Orchid Conservatory to which my family and I slogged through the puddles and drips. The five story, 8000 square foot conservatory houses thousands of tropical plants including orchids, and it was the orchids that I wanted to see. 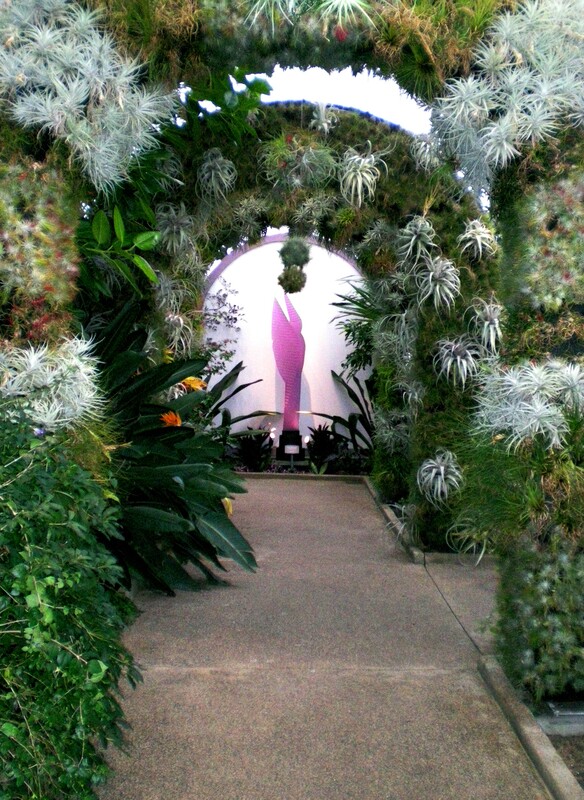 Living archways combine horticulture and architecture to a real "wow" factor! Starting January 20th and extending to March 18 the Conservatory is hosting it’s “Orchid Spectacular” and spectacular it is. Both hidden in naturalized settings and sitting out in plain view next to beautiful sculptures and permanent structures jewel like blooms jump out of the greenery at visitors from every direction. From the vivid reds and oranges of Cattaleyas to the more muted mauves and rusts of Cymbidiums even the most jaded visitor would be hard pressed to not find something at which to wonder. I brought my own jaded visitors with me in fact: children. As anyone with children can tell you in this electronic age, finding something to impress the young is a challenge, but even the 6 year old was enthralled by the colors, shapes and smells in the jungle like atmosphere. 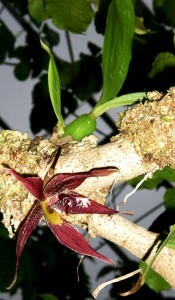 Even overhead the naturalized orchids peak out of the greenery at visitors. However it wasn’t just the orchids on display that make this event so fantastic. Visitors are taken on an “expedition” following in the footsteps of the orchid hunters, the early explorers who traveled the uncharted wilderness for their wealthy patrons to discover and bring back the jewels of horticulture- orchids. 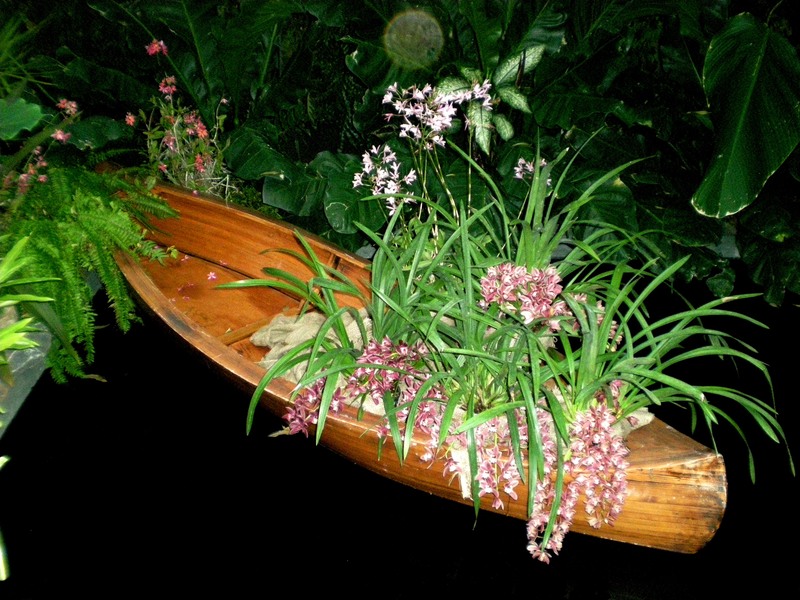 Fabulous displays offer a glimpse into the wild footsteps of an Orchid Hunter. while visiting each informational station. From mosquito netting to a full sized camp site we experienced the feel of early exploration, without the mosquitoes, malaria, and other dangerous discomforts those early explorers faced. A fabulous way to spend a cool January afternoon. The Daniel Stowe Botanic Gardens is located at 6500 South New Hope Rd. Belmont, NC 28012. Admission to the gardens is $12 for adults, $11 for seniors, $6 for children 4-12 and Free to garden members and children 4 and under. To learn more about the gardens and this event visit www.dsbg.org. Written by: Dawn Gerdes on January 24, 2012. Belmont is just west of Charlotte off of I 85. It’s about a 3 hour drive from Fayetteville.